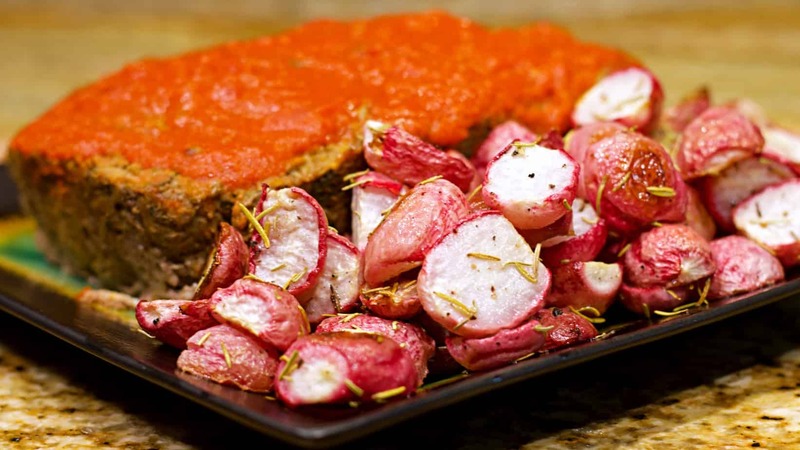 Here’s a keto-friendly Meatloaf recipe that will have your family’s bellies full all night. There are some really satisfying feelings from making a warm home-cooked meal, especially when you are trying to stay focused on maintaining your way of eating. While most traditional meatloaf recipes will have bread crumbs, or crushed up crackers in them, this simple recipe is packed with some seasonings and vegetables to enhance its flavor and keep it nice and filling. As a side dish, I encourage you to try these Roasted Radishes, as they are a low-carb alternative to roasted red potatoes. Don’t worry, the flavor of the radishes completely changes when you roast them in the oven or the air fryer and they lose that sharp bite that they have to them when raw. The difference in texture and flavor between raw radishes and cooked radishes is as drastic as the difference between a raw potato and a cooked potato. If you’ve ever tried to bite into a raw potato you’ll know that those are even less tolerable than radishes, yet somehow people crave fried or cooked potatoes. 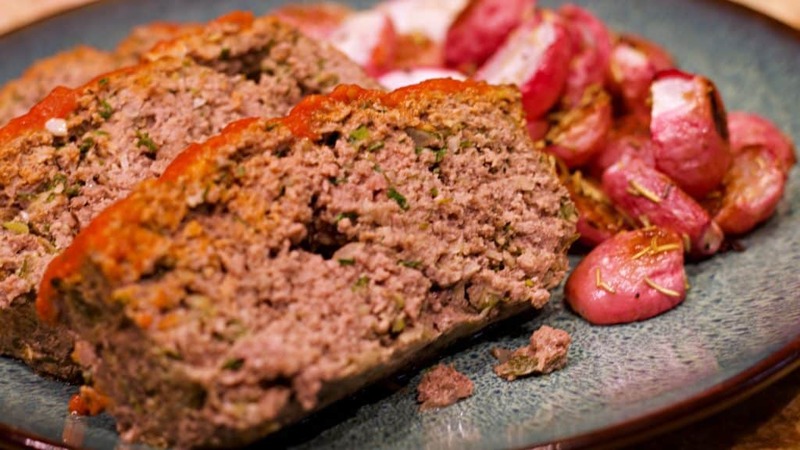 As an alternative to preparing this as a Keto Italian Meatloaf, you could take the meat mixture and form it into meatballs and bake those instead if you wanted to try your hand at making some meatball marinara. Speaking of which, this Rao’s Sensitive Marinara Sauce is probably the lowest carb Pasta Sauce that you can find that is natural. The entire jar has 5 measures servings in it at only 3 carbs per serving. So you COULD literally eat the entire jar and only have 15 total carbs. That’s just crazy! In a Food Processor Shred the 1/2 Zucchini, and then chop with the 4 Cloves Garlic, Shallot, and Parsley. Then Season with Salt, Pepper, and Dry Thyme. Grate approximately 1/4 Cup of Fresh Romano Cheese into the Zucchini mixture. And Set the mixture aside. In a Large Mixing Bowl place the Ground Beef and 2 Large Eggs, and add the Zucchini mixture to it. Stir by hand until evenly mixed, but be sure not to over stir the meat or it may lose some tenderness. Try just folding the ingredients together by hand and mushing it up a little. Place the Mixture into a Dark Loaf Pan, and coat with 1/4 Cup of Rao’s Sensitive Marinara Sauce. You can either add the entire 1/2 Cup of Rao’s on top now, or save the other half to add on top of the Meatloaf after it comes out of the oven. In a Colander rinse off the 4 Bunches of Large Radishes and then cut the tops and roots off of them, cut them in half, and set them in a Medium Mixing Bowl. Drizzle the Radishes with 3 TBSP Chosen Foods Avocado Oil, sprinkle with Salt and Pepper, and 2 Teaspoons of Dry Rosemary. Toss By hand. Spread the radishes out on a Large Baking Sheet covered in Parchment Paper. SPECIAL NOTE: You can use other types of Marinara Sauces, but the Rao’s Sensitive Marinara in particular has only 3 total and net carbs per 1/2 Cup serving, so this adds very little amounts of carbohydrates to the meatloaf, but it does add flavor for sure. It is not a cheap sauce by any means, but plan to use it in a few other dishes over the next few days such as our Keto Pepperoni Pizza or our Keto Calzones! Was AMAZING! Definitely will be making this again! Can you make the radishes like that and use them in stew?? ?